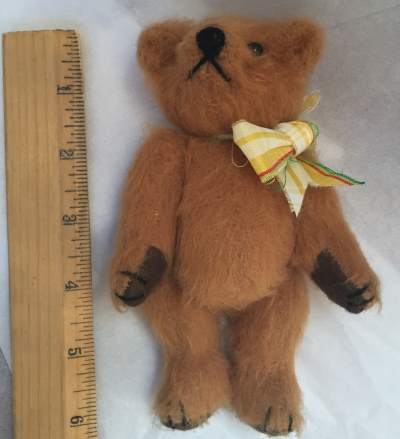 1982 Teddy Bear By Award-Winning USA Artist Sue Kruse. Hand-stitched black embroidered nose and a happy smile. Turned up nose, rounded ears. Golden brown color, with contrasting buff pawpads. Original Tush tag. Original paper tag but with a tear. 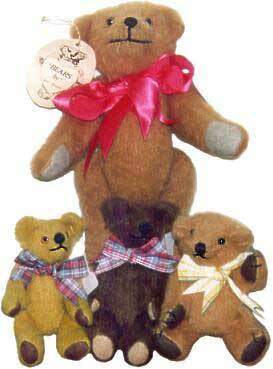 Vintage 1982 Originals By Teddy Bear Artist Sue Kruse. The 10 inch Teddy Bear with red bow is shown at the back, standing behind the seated miniatures.